In February, CVS announced that it will stop selling cigarettes and other tobacco products at a cost of approximately $2 billion in annual sales. Now, it appears that the company plans to compensate for that loss with it’s Caremark business unit. CVS Caremark is one of the largest pharmacy benefit management companies in the United States, which works between insurance companies and pharmacies. CVS Caremark will soon require that customers filling a prescription at a pharmacy selling cigarettes and other tobacco products make an extra co-payment. CVS pharmacy would thus become a more attractive place to fill prescription medications, making the company money in pharmacy sales as customers save money in the process — or more accurately, don’t pay more for their prescriptions at other pharmacies. 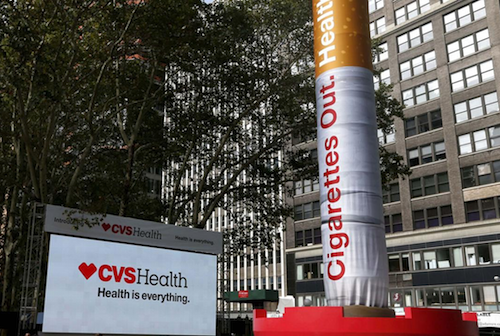 CVS Health cites a recent study suggesting that policies that eliminate the sale of tobacco products in any retail outlet with a retail pharmacy was associated with reductions in the number of people that purchased tobacco products . Brennan et al. The Effect of a Policy to Eliminate Sales of Tobacco in Pharmacies on the Number of Smokers in the Region. CVS Health.